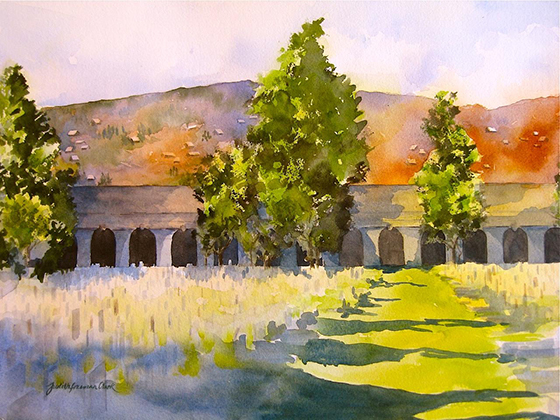 Judith Freeman Clark has been painting in transparent watercolor since 1968. Her work, done in a realistic style, has been included in shows at Cape Cod Art Association, Barnstable, MA; Harvard University’s Arnold Arboretum, Jamaica Plain, MA; the Zullo Gallery, Medfield, MA; Monson Arts Council, Monson, MA; the Library Arts Center, Newport, NH; Plymouth Guild for the Arts, Plymouth, MA; and The Sprinkler Factory, Worcester, MA. Clark’s paintings are also in private collections, and she had two solo exhibitions in 2013 — a spring show at Bethany House of Prayer, Arlington, MA, and a summer/fall show at the Bowes Gallery, Wachusett Regional High School, Holden, MA. She attended the Vesper George School of Art, Boston, MA, and in recent years has studied with Robert J. O’Brien (VT), Richard Stephens (AR), and Jo Ellen Reinhardt (MA).